Có bao nhiêu loại mã vạch một chiều? 1 Ansi39 ANSI 3 of 9 (Code 39) uses upper case, numbers, – , * $ / + %. 2 Ansi39x ANSI Extended 3 of 9 (Extended Code 39) uses the complete ASCII character set. 3 Code_2_of_5 2 of 5 uses only numbers. 4 Code25intlv Interleaved 2 of 5 uses only numbers. 6 Code39 Code 39 uses numbers, % * $ /. , – +, and upper case. 7 Code39x Extended Code 39 uses the complete ASCII character set. 8 Code_128_A Code 128 A uses control characters, numbers, punctuation, and upper case. 9 Code_128_B Code 128 B uses punctuation, numbers, upper case and lower case. 10 Code_128_C Code 128 C uses only numbers. 11 Code_128auto Code 128 Auto uses complete ASCII character set. Automatically selects between Code 128 A, B and C to give the smallest barcode. 12 Code_93 Code 93 uses uppercase, % $ * / , + -, and numbers. 13 Code93x Extended Code 93 uses the complete ASCII character set. 14 MSI MSI Code uses only numbers. 15 PostNet PostNet uses only numbers with a check digit. 16 Codabar Codabar uses A B C D + – : , / and numbers. 17 EAN_8 EAN-8 uses only numbers (7 numbers and a check digit). 18 EAN_13 EAN-13 uses only numbers (12 numbers and a check digit). 19 UPC_A UPC-A uses only numbers (11 numbers and a check digit). 20 UPC_E0 UPC-E0 uses only numbers. Used for zero-compression UPC symbols. For the Caption property, you may enter either a six-digit UPC-E code or a complete 11-digit (includes code type, which must be 0 (zero)) UPC-A code. 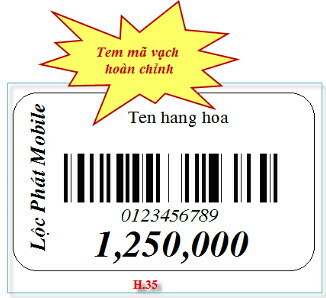 If an 11-digit code is entered, the Barcode control will convert it to a six-digit UPC-E code, if possible. If it is not possible to convert from the 11-digit code to the six-digit code, nothing is displayed. 21 UPC_E1 UPC-E1 uses only numbers. Used typically for shelf labeling in the retail environment. The length of the input string for U.P.C. E1 is six numeric characters. 22 RM4SCC Royal Mail RM4SCC uses only letters and numbers (with a check digit) This is the barcode used by the Royal Mail in the United Kingdom. 23 UCCEAN128 UCC/EAN 128 uses the complete ASCII character Set. A special version of Code 128 used in HIBC applications. Mã vạch 2 chiều là gì?